In these five stories, you will meet people significant to the life of Maldito and the fictional village of Agua Rocosa. Eufemia and José, each of whom is the 13th child of a 13th child, she of a line of mothers, he of a line of fathers, are Malditos unwilling parents. José comes from a long line of fishermen and is witty, intelligent and above all, tough. Eufemia is obsessed with the ancients and can hold her own with anyone. Her sheer power of will is indomitable. Will their union break the curse and produce the child that will fulfill the prophecy of ancient Mayans? Of course you will meet the unfortunate Maldito himself. How will he survive a loveless home, bereft of care and any but the most basic interactions? Like all of us, he is susceptible at the spirit level to the barbs and kindnesses of others. Perhaps you will care. Perhaps you can help him as he tries to make his way. In the third story in this sequence, you will see young Maldito on the streets of Agua Rocosa, sketching the buildings and tourists there. But watch carefully! He also sketches things others are simply not able to capture on paper: the wind worrying and lost among rocks on a hillside, the sheer joy in the bright smile of the sun, the sorrow weeping from a heavily laden rain cloud. You will come to know the Storyteller himself of the Stories from the Cantina, Juan-Carlos Salazár, who witnessed the beginning of a prophecy at the age of seven and has never forgotten it. To keep his customers entertained, he relates stories of the magic that lives all around but that many forget once they don the cloak of adulthood. And finally you will be sitting at the bar when Juan-Carlos tells the story of The Man of Mud, whose unnatural birth he personally witnessed when he was only seven years old. Some forty years later, he understands what the man of mud meant when he uttered the words "one wrongly called accursed will come." Come along and witness the fulfillment of ancient prophecy. 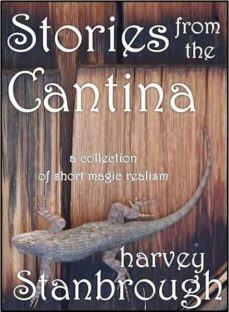 If youve enjoyed the works of Gabriel García Márquez and Isabel Allende, you will enjoy these Stories from the Cantina.